The Predestination Combat Beta is now live. If you’re signed up to beta test the game, check your Kickstarter mail or email for a message from us with a link to download the game. If you’re supposed to be in the beta and haven’t received the link by the morning of Friday 20th, please email combatbeta@brainandnerd.com or message us on Kickstarter and we’ll sort it out. We would appreciate it if you would refrain from sharing the combat beta or download link publicly as the game is not ready for the general public and is still using mostly placeholder 3D models and sounds. For those of you who aren’t in the beta, check out the video below of us playing through it and let us know what you think! Help / Instructions Thread – If you’re having trouble getting the game to install or run, or would like to ask any questions. If the game crashes, a dialog box will also appear and allow you to submit a direct bug report with a screenshot and details. We would appreciate it if you could fill this in and submit it, as it really will help us squash bugs. Stage 4: Final beta with all three combined, and worked on based on feedback from the first three stages. This final beta stage will then undergo regular gameplay iteration and feedback cycles until it’s release quality. We’ve also managed to secure a small local arts grant to help build a 3D ship designer for the game, which should also be introduced at some point after release. If there are any changes in any of these plans, we’ll make an announcement about it. We’re pleased to announce that Predestination has won its first award! Last week we received the 2013 DANI Award for Best Gaming and Animation Project of the Year. 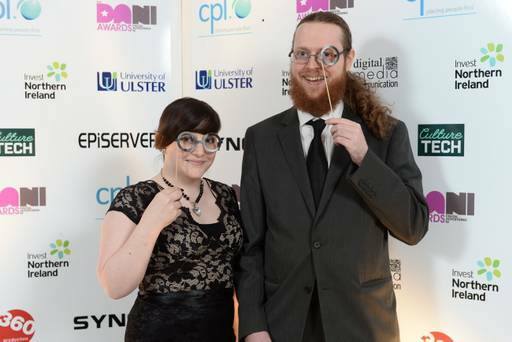 The DANI Awards are given for outstanding work in Northern Ireland’s digital media industries, and this year were held at the week-long CultureTech festival in Derry. Brain and Nerd Co-Director Tina Lauro (left) and Director Brendan Drain (Right) at the 2013 DANI Awards. We’ve been slowly climing the ladder toward the top 100 projects on Steam Greenlight, and are now about 70% of the way there. Once we break into the top 100, Valve is more likely to take notice and Greenlight the project. The good news is that Valve has significantly increased the rate at which it greenlights games, so we stand a good chance of success if we can get enough votes to be noticed. Getting greenlit would take a lot of pressure off us as Steam is the largest digital distribution platform for games by far. Even if we get on Steam, the game will also of course be available via direct download with no DRM at all, as promised. We’d like to give a huge thank-you to all of you for backing Predestination and following its development with interest, and to everyone who has voted for Predestination on Steam Greenlight or sent news about the game to gaming blogs. It’s been a long and challenging road for us so far as a new studio embarking on its first game project during an economic slump, and there’s still some way to go, but none of this would have been possible without your initial support. If you’re in the beta, we hope you like it and promise to take all of your feedback on board. Once again, thank-you from the entire team at Brain and Nerd! Tagged 3d, 4x, beta, beta-test, devblog, development, game, game design, game development, game-design, gaming, graphics, indie, indie game dev, indie game development, master-of-orion, moo2, predestination, sci-fi, screenshot, space, tactical-combat. « The first Predestination beta stage is on its way!